We are offering wide range of Industrial and Cool Mist Humidifier. 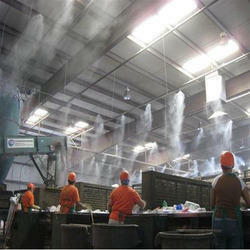 This is a complete solution for controlling humidity and cooling the air in a textile factory. Effective humidifying and cooling the environment supports high productivity, dyeing process, cooling and curing of textile coating, printing and logo. Industrial Humidifiers manufactured and offered by Cloud Tech are made out of finest quality materials and are exceptional in terms of performance. Available in different models, these can be customized and are used for humidifying purposes. These are characterized by application specific design and are built and tested as per the international standards of quality. Looking for Industrial and Cool Mist Humidifier ?